When it comes to Native Instruments, one thing people speculate about almost as often as when the next version of Komplete will be released is when the next big Native Instruments sale is going to happen. While no one outside the company can answer those questions with any certainty, studying the past can often help us make better guesses about what is yet to come. It is in that spirit that I embarked on a historical review of official Native Instruments sales. After several days of hunting down information on every sale I could find involving the company's Komplete, Maschine, and Traktor lines, I compiled a worksheet that indicates the dates when the sales were in effect, and which products each promotion included. I color-coded each sale to indicate which time of year it fell under so I could get a better idea of what kinds of sales Native Instruments typically offers in the different seasons. The Legend tab describes the different columns, and the Stats tab has a few bits of analytical data that are automatically updated whenever I add a new sale to the list, plus some "manual stats" that I tally up by hand after making major updates. You can click the image below to visit the worksheet. The rest of this post is an analysis of the data, plus some other details about the worksheet. Click the image above to view the raw data. Of all the types of sales Native Instruments offered that I could find, discounts on new purchases of Komplete bundles were the most rare (only 9% of all sales as of this writing), and discounts on upgrades or crossgrades to Komplete were the second-most rare (21%). Please see the "Notes About the Worksheet" section for the distinction between new purchases and updates/upgrades/crossgrades. When there was a sale on Komplete bundles, it has always been either for new purchases or for upgrades/crossgrades- not both. 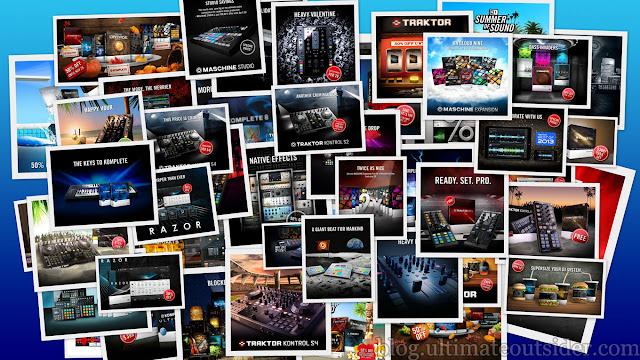 Although the different kinds of Komplete bundle discounts haven't been offered simultaneously, they occasionally occurred within a couple weeks of each other (2012, 2014). The most common season to find discounts on new Komplete bundle purchases was Summer (4 times out of 5 total sales), and the most common time for discounts on upgrades and crossgrades to Komplete was Spring (7 out of 12 sales). The most common season for Maschine-related sales was Autumn (7 out of 16 sales). The most common times for sales and specials involving Traktor were Autumn (7 out of 22 sales), followed closely by Summer (6 out of 22 sales). Historically, the busiest season for Native Instruments sales is Summer (32% of all sales I've recorded so far). Autumn and Spring are tied for second (at 25%), while the Winter months were the least likely to see new sales, accounting for only 18% of the sales I could find data for. Of all the promotions I discovered that were in effect during a Black Friday, only one of them offered a discount on Komplete bundles (the Thanksgiving XXL sale in 2013), and that was only on upgrades, not new purchases. Not a single Black Friday sale I found included new purchases of Komplete or Komplete Ultimate. Over half of all promotions recorded involve Native Instruments hardware, whether it's for Maschine, Traktor, audio interfaces, or the new Komplete Kontrol keyboards. Specific Traktor models covered in previous sales include: Traktor Audio 2 DJ, Audio 4 DJ, Audio 8 DJ, Traktor Kontrol S4, Traktor Kontrol X1, Audio 6, Audio 10, Traktor Kontrol S2, Traktor Kontrol Z1, and Traktor Kontrol Z2. Specific Maschine models covered in previous sales include: Maschine, Maschine Mikro, and Maschine Studio. Hardware products from the Komplete line that have been covered in previous sales include: Komplete Audio 6, Komplete Kontrol S25, Komplete Kontrol S49, and Komplete Kontrol S61. 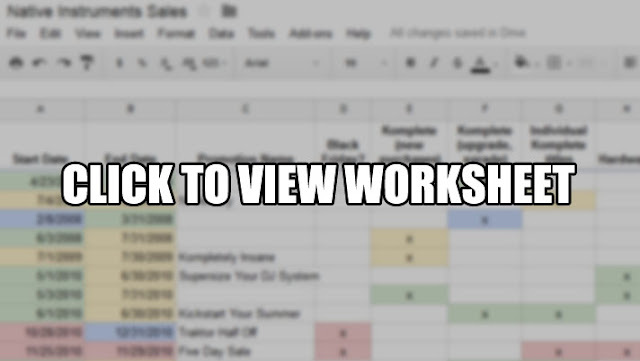 In cases where a given promotion straddled two different seasons, you'll find that the Start Date and End Date fields of that sale will be colored differently, while only one color is used in the columns indicating what kind of products are covered in that sale. I chose the color/season based on which season held the most days of that specific promotion. This is why many sales during the Christmas shopping season are marked red; because they ran for more days at the end of Autumn than they did at the start of Winter. The Hardware column in the Data tab of the worksheet straddles all Native Instruments product lines (even Kore). Maschine and Traktor have their own columns, but since some sales in those product lines only involve software (Maschine expansions or Traktor Pro upgrades, for example), you can cross-reference to the Hardware column to determine what kind of sale it was. Regarding sales that involve Komplete bundles, I consider a promotion a "new purchase" if customers are not required to either previously own or make a new purchase of any other Native Instruments product. A sale that requires you to own another Native Instruments product is a crossgrade. Sometimes there are "bundle" discounts where you get a reduced price if you buy two items at the same time- for example the "Dynamic Duo" sale from Winter of 2014 where you could get a discount on Komplete 9 if you bought it along with a Maschine. There was one deal from 2008 where you could get a discount on Komplete 5 if you could prove you owned one of a handful of specific third-party DAWs. I didn't count that as a crossgrade since it didn't require ownership of a Native Instruments product. I had multiple sources of varying degrees of accuracy for sale information. If you see a different start date listed for a sale than what you see listed at the Reference link for that sale, it probably means I found another source with more accurate date information. Stop dates were much easier to verify for sure. The great majority of the sale data I found was between the years of 2010 and 2015. As of this writing I've only found solid information on five sales previous to 2010. I'm sure there were many more sales; it's just increasingly hard to find this info. If you have any corrections or know of any sales I missed, please let me know in the comments. Thanks! @Aaron - I only tracked sales of Native Instruments products, not the NKS partnership sales like with Heavyocity, Arturia, and Waldorf. Three Heavyocity packages are sold by NI and bundled with Komplete, but I did not record any sales on third-party products that fall outside of the Komplete bundles.